Visit any Bouclair Canada store location or Bouclair Canada online and enjoy a special sale where you can save up to $40 off your purchase! 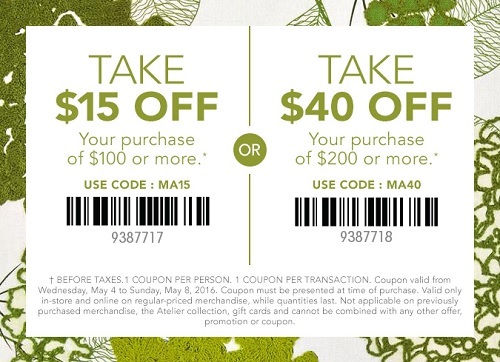 Take $15 off your purchase of $100 or more. Or, take $40 off your purchase of $200 or more. To receive the offer in-store use a printable coupon (available at Bouclair Canada online). To receive the offer online, use promo code MA15 or MA40, depands on spending. Official source of the information is Bouclair Canada. More details about the promotion available at Bouclair Canada store locations or online. Offer ends on Sunday, May 8, 2016.